Thanks to Pinterest, I often discover random, useful bits of DIY. Such as how to remove the wax from pretty candle jars so you can reuse them. And how to make homemade cat treats. And how to take detox baths. When I saw this pin, I was intrigued and spent two or three days researching different detox baths, what they are supposed to do, and the pros and cons. I was skeptical that they would actually do anything more than relax me, but since I was feeling adventurous, I sent aside a Sunday evening sometime last year and took my first detox bath. I’ve been hooked ever since. Before you start to think I’m turning into some sort of “crunchy” weirdo, I assure you I’m not. But I do think there are some merits to taking detox baths. When I do it correctly, and follow all the steps as you’re supposed to, I can really tell the difference the next day. If I’m beginning to feel ill, a detox bath really does make me feel better. It’s never prevented or cured a cold, but it has helped shorten one and made me feel like I could be around people the next day. There are many detox bath recipes out there, but I’m only going to share one. I’ve tried others and this is the one that I think works the best. Read on for the how-tos and my own suggestions. Fill your (clean!) tub up with hot water. You want it to be very hot, but not so hot that you burn yourself or can’t get in right away. 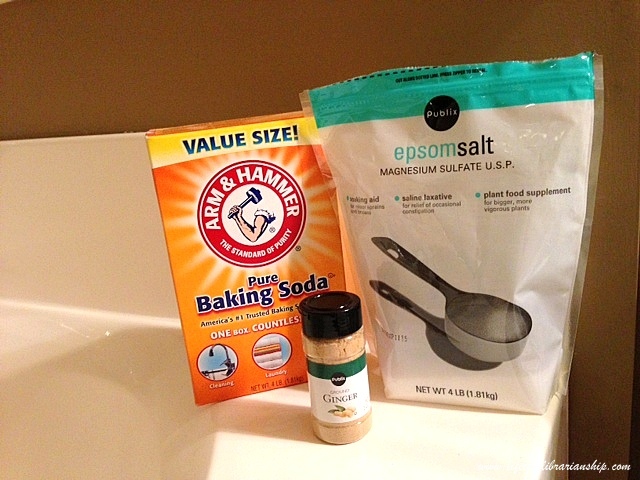 When the tub is filled to your liking, pour in the epsom salts and desired amounts of baking soda and ginger. Swish it around and soak for at least 20 minutes but no longer than 40. Drink plenty of water before, during, and after the bath. You’re going to sweat. A lot. Way more than you expect. You should start sweating within the first 5 minutes, maybe sooner. This is why it’s so important to hydrate throughout. Keep a washcloth or towel nearby to wipe off your face. You’re going to need it. This isn’t a bath to get clean. You’re going to sweat more than you have ever imagined you could while sitting still, and you’re going to want to shower, but don’t. You’ll stop the detox and it could lessen its effects. Keep the bathroom fairly warm. No reason to get cold when you get out! The best time to take this bath is right before bed. After you get out of the tub and dry off, put on your pjs and get into bed. You will continue to sweat so the detox itself is actually lengthened. Try to avoid showering after the bath if possible. I know it’s gross, but think of all the toxins your body is getting rid of. Despite the sweating, a bath is a bath and it’s supposed to be relaxing. Light some candles, dim the lights, grab a good book, and tell everyone to stay away. This is the perfect opportunity to get some time to yourself. Avoid excess salt and alcoholic beverages the day of your bath. You’ll sweat out all the wrong things. Don’t be surprised if your skin turns red while you’re in the bath. The ginger is responsible for that unless the water is too hot. Again, it should be hot, but you shouldn’t feel like your skin is burning. If you start to feel more than a little lightheaded, dizzy, or nauseous, get out of the bath right away, sit down, and drink lots of cool water. Be very careful when getting out of the tub. Epsom salts make the tub slippery and you may be lightheaded or dizzy. Stand up slowly and use caution when getting out of the tub and drying off. If you are pregnant, have heart problems, or have fainting spells, do not take this bath. 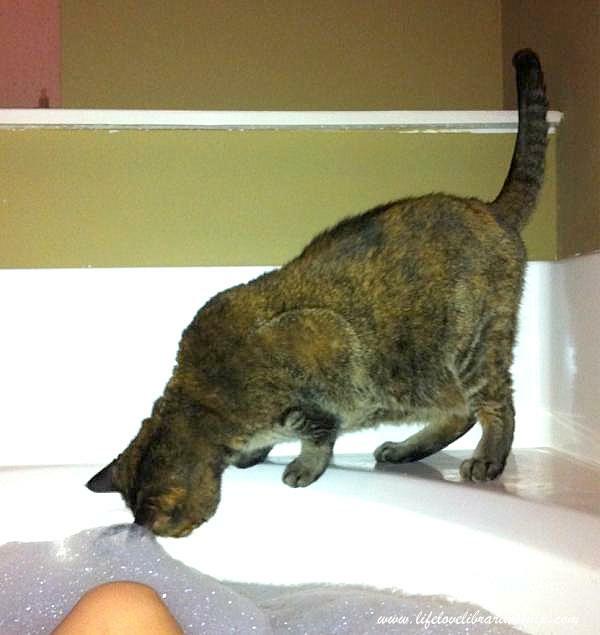 Poor Caty…she’s so confused when I take baths. What do you think about detox baths? Is it something you’d try? Disclaimer: I am not a medical professional nor an expert on natural remedies. I simply like these baths and think they are effective. Speak to your health care professional if you have any concerns. Yay! You’ll have to let me know what you think. I totally want to try this [except you mentioned that whole ‘don’t do this if you have fainting spells’ thing. oh well, i’ll just be a rebel]!! And bath or no bath… nothing stops my furbabies from wanting to get next to Moma (literally, they’ll try to jump in with me. Thankfully they’re only like 2 inches off the ground). So, I buy all my detox bath supplies at the dollar store. No sense in spending more than you need too. And it doesn’t matter if its an off brand because you’re just soaking in it and letting it go down the pipes. Anyway, I try to do this once a week. It works too. And I feel it’s better each time. Been about 4-6 weeks I’ve been doing this. You will continue to sweat for up to a few hours after the bath. I just fid this 1.5 hours ago and am still very sweaty. And about this Caty Cat, my pup is also confused by baths. He is more upset that I don’t want to cuddle. Ooooh, I’m definitely trying this! We just had a big discussions on epsom salts at work (very random, yes) and I gave a cousin a big basket of some recently because she raved about them. Can’t wait to try this! Happy New Year!! Even without the ingredients I still feel so much better after a hot bath. If I’m getting sick or have an upset stomach the tub is the first place I turn. I don’t get sick and if I do it only last one day, total.